Go to the main text. 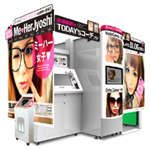 A purikura photo sticker machine consist of a photo booth, the monitor booth for editing images, and a terminal for collecting the stickers (from right to left). The monitor booth is usually covered by a curtain. ©MAKE SOFTWARE, INC. 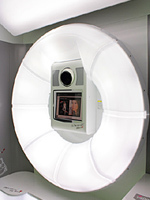 Inside the photo booth is a high-capacity flash lamp and a monitor below the camera for checking the photos. ©MAKE SOFTWARE, INC.
Purikura, a shortened form of "print club" in Japanese, refers to photo sticker booths that print out stickers of photo portraits set against backgrounds and frames selected by the user. Since their market debut in 1995, purikura have been a major hit in Japan, especialy among high school girls. The photo stickers have largely taken the place of souvenir photographs, and are traded among friends and shown in sticker albums. Easily purchased for the small amount of a few hundred yen, purikura have taken on an important role as a kind of communication tool for friends to reaffirm their bonds. Now 17 years since hitting the market, purikura photo booths still bring enjoyment to groups of friends and continue to evolve as machines that bring to life the girlhood ideals of cuteness and beauty. Magical Machine for Creating the Faces and Styles that Young Girls Long ForPurikura machines consist of a photo booth with a monitor on the side to check and edit the captured images. A special pen is also included for selecting and drawing on the images if desired before they are printed out. Moreover, purikura today are equipped with functions to guarantee that skin looks beautiful in the photos. A high-capacity camera flash lamp illuminates the booth in pure white light. The monitor allows users to select from backgrounds and frames to create an image of their own choosing, designed to be cute, soft, or cool. When this is done, the photographed image is given a three-dimensional look, and luster or blush can be added. In this way, the machines allow users to choose what sort of beauty they would like to apply to their complexion. Legs can be made thinner and longer by using this automatic processing function. ©MAKE SOFTWARE, INC.
Purikura even feature a function for making eyes look bigger. The camera identifies the eyes in the shot and then expands the size of the dark areas only to accentuate the pupils. Depending on the machine, it is sometimes possible to make the eyelashes appear longer and thicker as if mascara or extensions had been used, giving the eyes a fuller and prettier look overall. Other available options include automatic processing for lengthening only the legs, an attached pen for drawing even longer eyelashes, and even a function for slimming faces. Corresponding to their respective functions, the names of some of these options translate as "beautiful face laboratory," "cosmetics for a lovely woman," and "beauty plus." Indeed, these options reflect young women's desire to go out of their way to capture cuteness and beauty in photographs. While looking at the monitor screen, users can have fun writing messages with a special pen and selecting patterns and images. ©MAKE SOFTWARE, INC.
Users can assemble photos in a collage and design a single sticker that looks like a page from a magazine. ©MAKE SOFTWARE, INC. Your favorite photo stickers can be sent to a mobile phone and easily uploaded to a blog. ©MAKE SOFTWARE, INC.
Another way to have fun at the purikura photo booth is by adding graphics and messages to the photo images. A special pen is attached to the monitor to allow users to input colorful messages along with the date of the photo and names of the friends photographed together. The latest purikura models offer a wide range of fun options, including graphics that can be added into the image such as flashy eyeglasses and rabbit ears, and functions that let users design a collage of multiple photos like pages of a magazine. Nowadays, the image data can also be sent to mobile phones, allowing purikura photos to be sent to friends and uploaded to personal blogs, Twitter, or other social media sites. 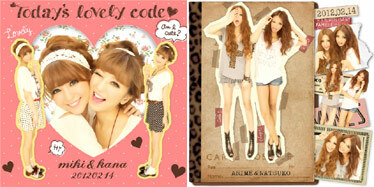 This shows how purikura has been continuously adapting to suit the lifestyles of young women. Recently, companies that have taken notice of these functions have been developing applications for smartphones that let users copy images and make handwritten illustrations in the same way that photo data is processed by purikura. These applications are making waves both in and outside Japan, topping one million downloads within the first month. Like the functions offered by purikura, applications that can lighten skin and accentuate eyes are coming out. Apparently, the purikura boom is now outgrowing the world of photo stickers.